Incase you missed this week’s stream (which is all but three people in the world) then you missed where I said I’ve been playing a game called Crashlands lately. I did some fanart on the stream, which is on my Facebook page, but decided to do a traditional picture of the main character, Flux, tonight. She is the purply alien thing. 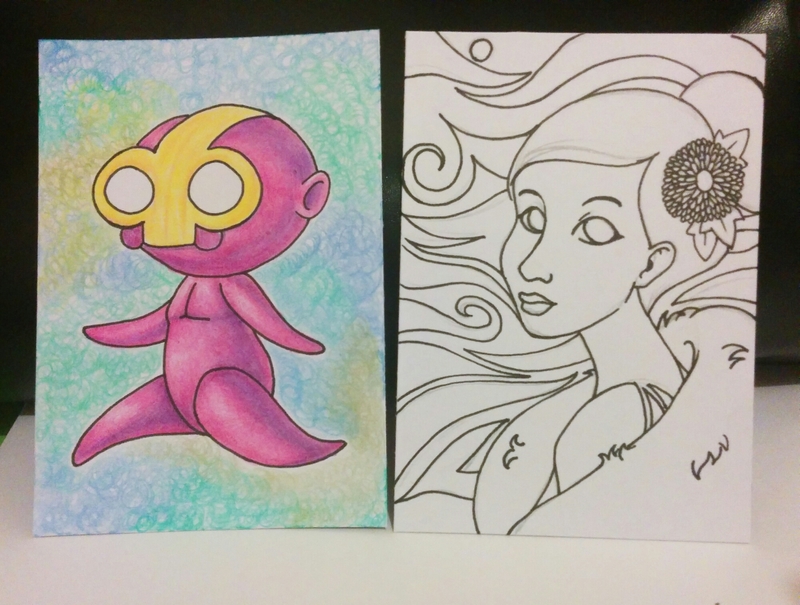 I made these pictures to be an Artist Trading card size, as it is a nice size for little sketches, so making a finished piece is easier and less daunting when you just need to make some art, but don’t want the commitment of a large piece. 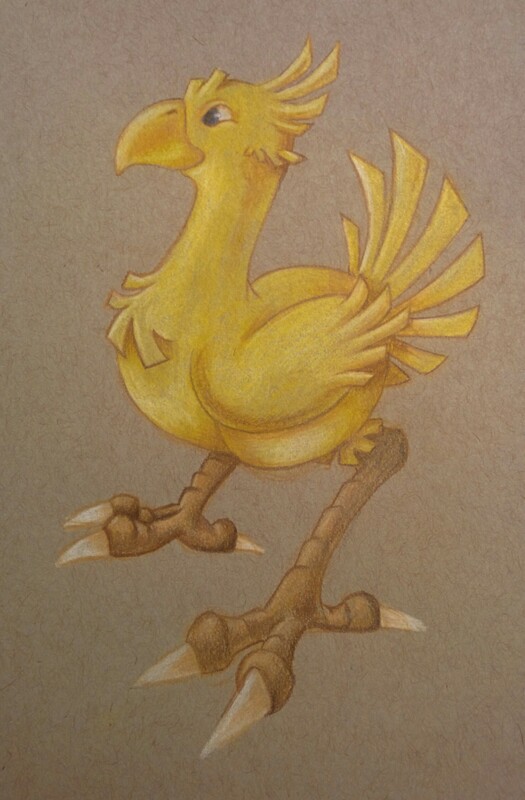 It takes some stress off, as the smaller you work, the less details you need, unless you’re working in hyper realism. I’m off to go play more Crashlands! See ya! Today, I went out… Yay! I went to an art and craft shop… Yay! 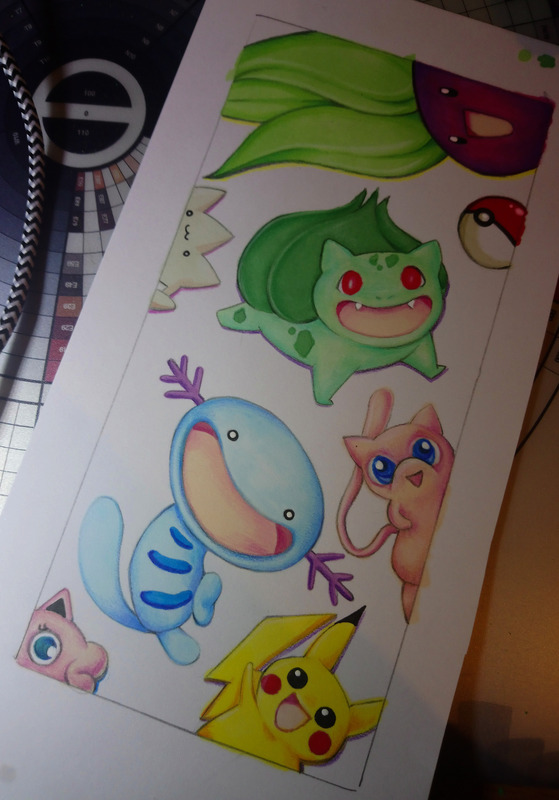 I bought a battery powered engraving machine and some watercolour paper… Yay! I saw people who weren’t my family!… OMG! I know you may not believe it, but it’s true. I also forgot to get batteries for the engraver, so I can’t talk about that yet. 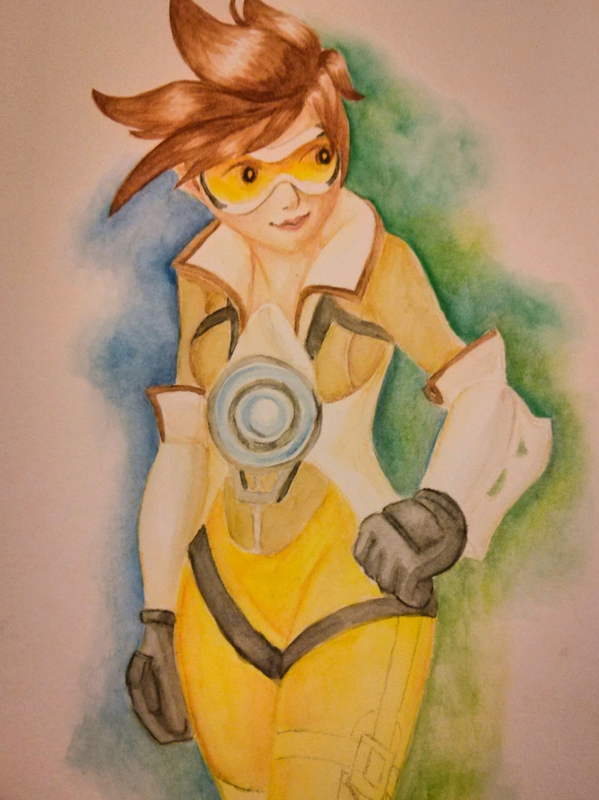 As for the watercolour paper, I decided to paint a picture for my part in return for buying me a game called Overwatch. 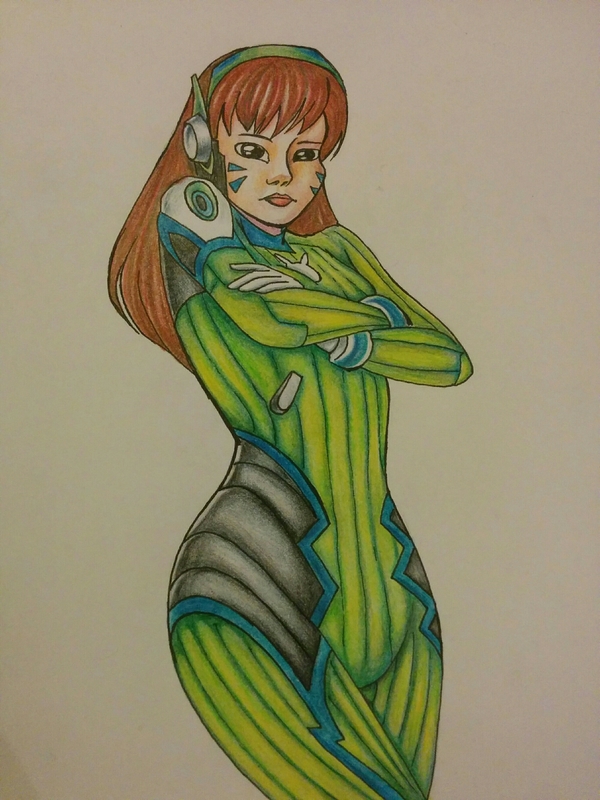 The painting is of one of the characters that he likes to play, Tracer. 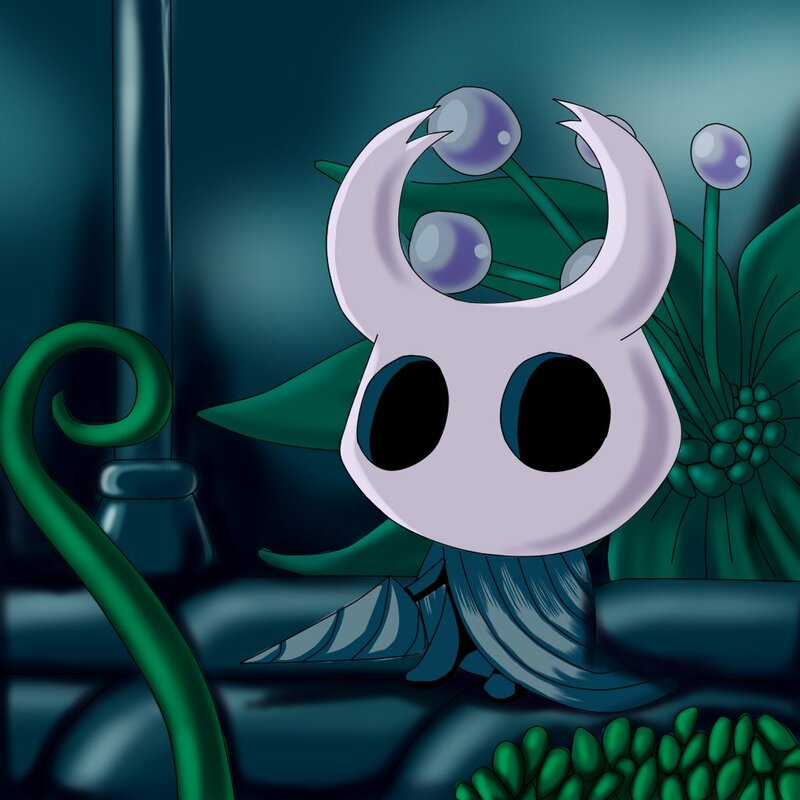 I haven’t quite finished, as we were playing the actual game for a bit. My favourite characters are Mei and Mercy, but as the game is new, I couldn’t find many pictures of them. Tracer is on the box, so she was easier to find references for. I will have to take screenshots for further fanart. The art and craft shop is really cool, as it stocks so many different things. I went back and forth down the aisles for a while until I needed to sit down desperately. Unfortunately, it’s hard for me to get to, as there isn’t a convenient bus going there, despite being quite a short car ride. Maybe I should save up next time, as I didn’t have a lot of money to spend this time, and I know I won’t be able to go back soon. At least I have a couple of days to recover my body from the trip, and have plenty of watercolour and engraving to practice. I just keep forgetting to film it, and every time I put the camera on, I can’t think of what to do! While setting my diary up for the year, the first prompt in the book is goals for the year. I did the typical lose weight and save money, but my number one goal is to draw more. 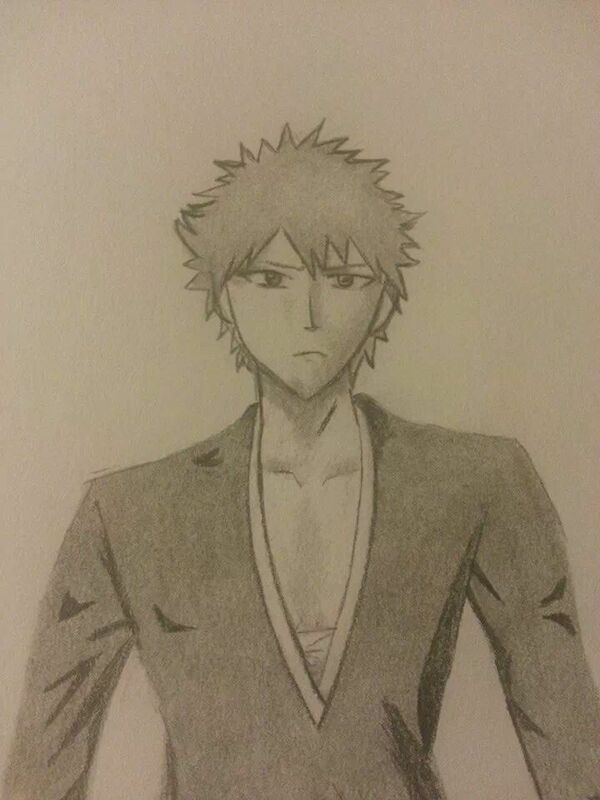 I could have put get better at drawing, but I won’t get there without practice. I hope to create at least one proper picture per week. Depending on the week will be whether the picture is big, small, digital, traditional, simplistic or complex. Practice is one step closer to getting better, no matter how small. 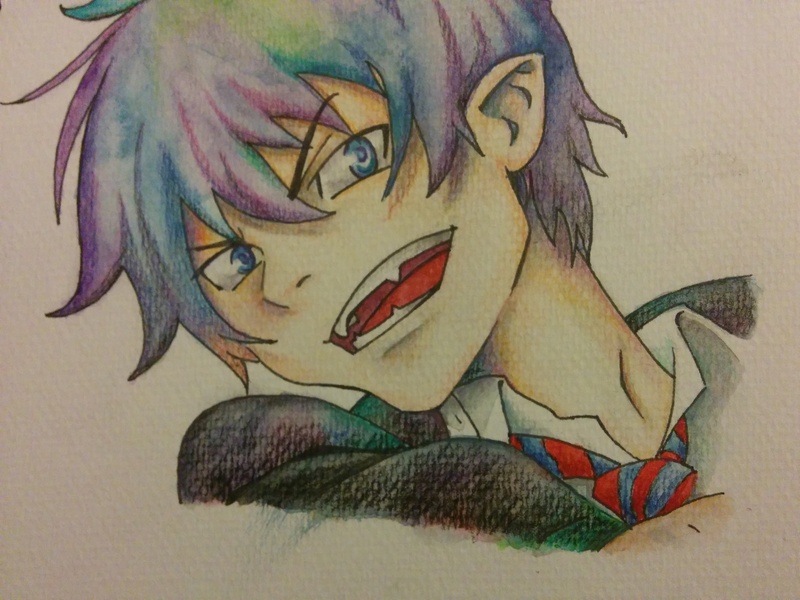 This picture, of Rin from Blue Exorcist, was inspired by a technique that I saw on YouTube, where the artist used watercolour as a base, then coloured pencil to define shadows and bring more colours into the picture. By using a light orange, purple and white, there is much more life in the skin than plain peaches and browns give. I ended up making the black areas really colourful to try another technique I saw, but it didn’t match, despite looking quite good. I’d like to do some more portraits this year. I know that if you look back a year in my posts, I’ll have said the same thing last year. I have gotten a lot better this year, and will continue to get better. My art is like a journey, with no end, I’m here to learn, and sightsee. Even if I’m the greatest artist of all time, there’ll still be things to learn about. It just takes a long time, because I’m trying to learn so many things at once, with all my crafting and living. I hope some creativity makes it into all of your New Year’s resolutions this year. Christmas is so crazy, and I am exhausted. It’s been boiling hot, and getting out to see Star Wars was a sweat-a-thon. It was a nice break from the gluing and sticking together cards, and I wanted to draw some fan art. Above is Rey, one of the main characters in the new Star Wars movie. I fell in love with her instantly, as well as BB-8, the droid. I did try to ink the sketch, but the pen I used was too big and I lost a lot of details, but I might try scanning and playing around with it on the computer. We’ll see how that goes, if I ever have time again. My lounge room has been officially turned into a card making factory, complete with trestle table and computer chair. I have less than two days and no energy to get these cards done. I can’t find the cat food box with the sentiments in them, and I haven’t even counted how many cards I need or have made. This is a present that I wrapped for my partners secret Santa at work. It took me more than a whole movie (a Knights Tale) to make the tag. I had to cut nine alphabets (the letters are three layers high, and there’s so many E’s in the way she spells Kendelle.) Luckily, all my other gifts are to people with three lettered names. 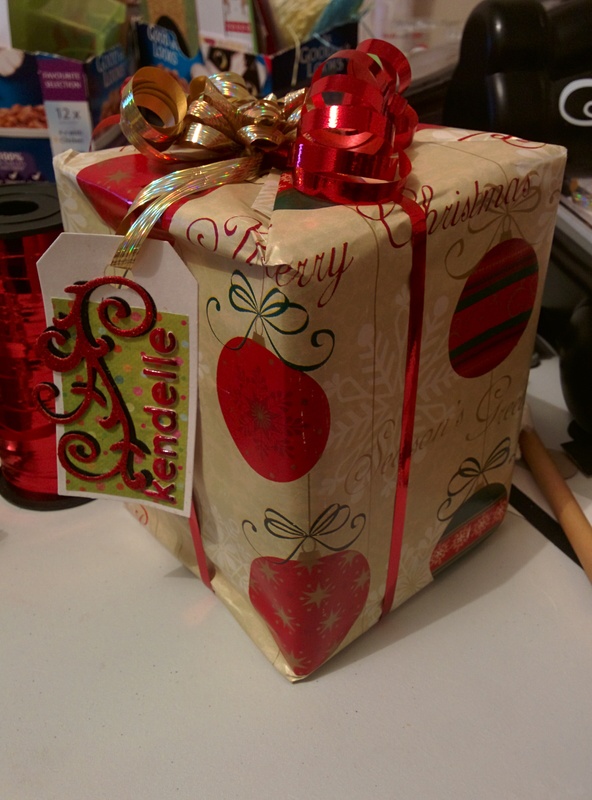 I also had to make my own ribbon bow for the present, as I didn’t think I had any. I found them afterwards. All this work for someone I’ve never met. I don’t know how much she appreciated the hand made aspect, but it’s still nice to do it for people. It pains me to think if people throw away my cards and things that I’ve made, but I can’t control it once I’ve given them away. I wasn’t able to do anything drawing wise, since my hands were playing up still, and I have plenty of homework to do. 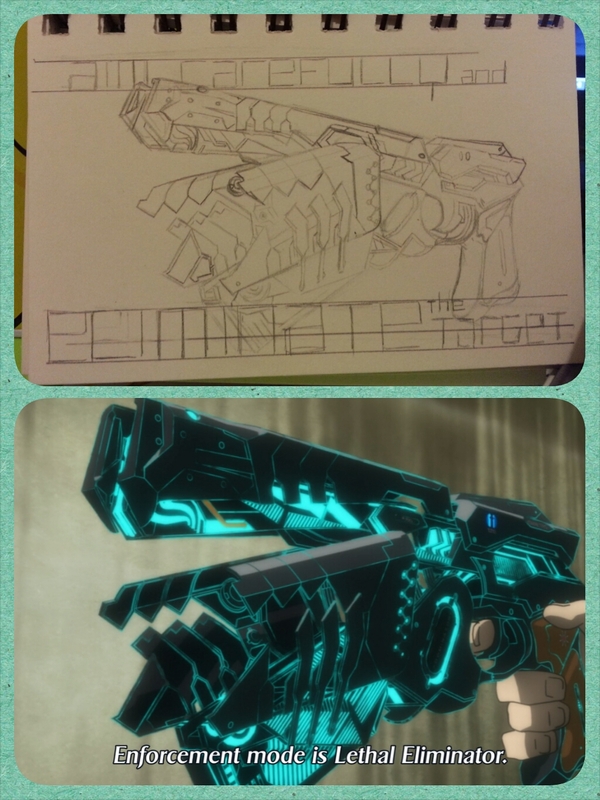 Here’s that sketch that I was talking about yesterday (top image), and the reference image (from the anime Psycho-Pass). I told you it was intricate. It doesn’t even look as tricky until you get into the details. 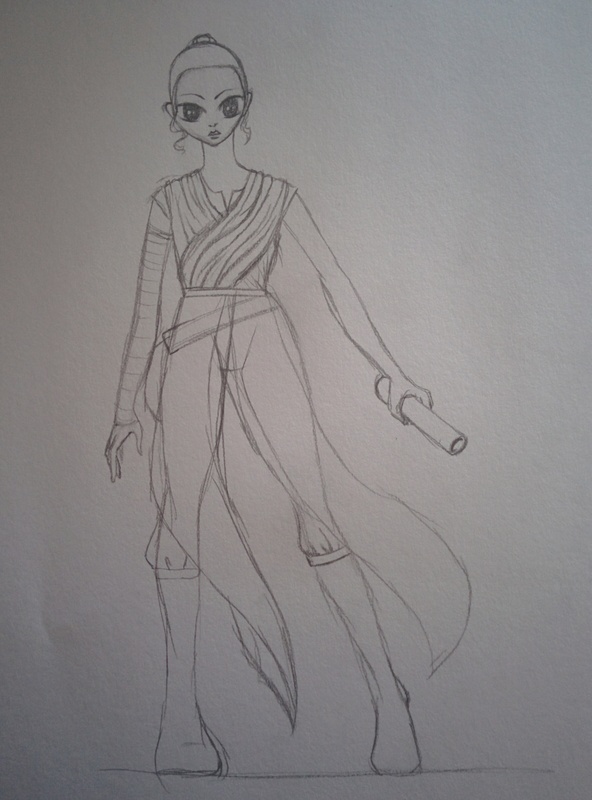 It is by no means an exact copy, I didn’t even use measurements for proportion, and freehanded it all. I’m unsure on how to proceed with inking, as all the lines on the gun are green, and the gun itself is black, but if I ink with green, I’ll have issues with the pencil, and I can’t erase it first because it’s too detailed to remember where the lines go. I guess this is why I’d use pencils and a light table, but I think the paper would be too thick, not pick up all the details and I’d have to draw it again and again. This was more about the image concept and colouring, so it’s not too much of an issue. I’ll probably line in thin black, then make a small green line next to it.